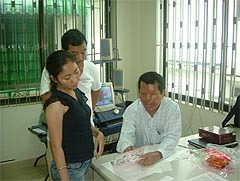 Nippon Telesoft has recently visited the Cambodian Blind Association in Phnom Penh in Cambodia. We met Mr. Mao, the chairman of the association and discussed supporting its education information service. The Cambodian population is estimated at around 15,000,000. After long term turbulence of war, and general unrest the country is now experiencing growth in many areas. 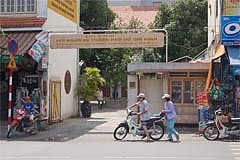 The HQ of the Cambodian Blind Association is in a mint condition and admirable 3-storied building, built 3 years ago, and supported by the Japan Foundation. About 20 staff give a wide range of assistance in areas of teaching which includes massage and Braille, etc. We also visited Mr. Kosal, the headmaster of the Kｒousar Thmey school in Phnom Penh, and agreed to give wide support, such as bringing in Braille printers, and altering the Braille software into the Khmer language etc,. We presented our Multi] and [Pro] Braille printers　to the Vietnam Blind Association (HBA) in Ho Chi Minh. We also presented a training programme on handling, repairing and maintaining equipment and a total of 5 Braille printers were started up. They will print Braille textbooks and etc. in Ho Chi Minh City and surrounding area. One can easily input Vietnamese text and translate same into Vietnamese Braille, especially with the new Vietnamese Braille software produced by Professor Dien in Ho Chi Minh University, The graphic software is also included, to enable more attractively printed textbooks. In Vietnam, there is a high visually impaired population who are victims of chemical defoliants. It is said to be 650,000 people out of total population of 80,000,000. The Educational environment had been not good enough for these visually impaired people with the lack of textbooks and other educational material. With the Braille printer [Multi], you can print ink and Braille simultaneously; therefore you can print social studies’ textbooks very fast. 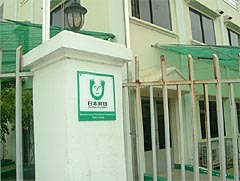 Nippon Telesoft cooperates producing the Vietnamese software and screen reader. 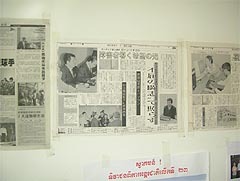 A sample of printing with “Braille Figure”. Nippon Telesoft has manufactured easy Braille graphic software “Braille Figure”, which can be utilised in making a Braille graphic like ordinary drawing software, and of course you can use our printers to print it out. It is also compatible with Windows. You can not make the graphics too complicated because of Braille, but you can make an information map, educational materials, etc. You can use it in a wide variety of applications? If you are already a user, registration costs 1,000 yen for the software. Please let us know if you are interested in using it. The software is compatible with foreign language, such as English and other European languages, Chinese, Korean, Vietnamese, 32 altogether. If you are interested in foreign language software for learning etc. please contact us. * In order to use this file, "BrailleFigure" is required. Please extract the downloaded file "BrFigInst.zip" to arbitrary places. Execution of "BrailleFigure.msi" will start installation. “DOG-Multi” with handy voice guide. It is compatible to many different languages. It is very useful to study foreign language. As “DOG-Multi” is famous for its quiet operation, it has been utilised in schools and blind and visually impaired related institutions, its voice guided “instruction” facility is especially popular among blind and visually impaired users. This feature informs the user of the functioning of the Braille printer by voice; 10 different messages, such as “Functioning”, “No paper”, “Paper jam”, “Configuration switch error”, etc. You can also detect the failure of the printer; blind and visually impaired users who used to anxious about the state of the printer, can use it with confidence. “DOG-Multi” has been sold overseas under the name of “Gemini”, it has a voice guide in the local language such as English, Italian, Chinese, etc. it has received recognition as “a piece of equipment which is well thought out and considers the needs of blind and visually impaired people”. The Gemini wins great popularity at an American exhibition. Nippon Telesoft had exhibited their printers at 21st Annual International Technology and Persons with Disabilities Conference in ‘CSUN’ (California State University, Northridge) in Los Angeles between March 23rd and 25th. There about 600 manufacturer of visually impaired and hearing impaired related participated from not only all over America but all over the world. It was the fifth participation to our company, we exhibited the Braille printers “Gemini”, and made an appeal of its quietness and simultaneous printing capability of ink and Braille. We received many questions and inquirery from an Education ?related organisation, a Braille library, and some individual who expressed their wanting of buying it for themselves. In the United Sates, there is our distributor, ET (Enabling Technology, HQ is in Florida) has already sold “Gemini” to many customers, and the users are much satisfied with it. There has been an increase recently in the number of blind and visually impaired children, attending ordinary schools instead of schools for the blind during their compulsory education. The Nippon Telesoft ‘DOG Multi’ Braille printer has been approved as an educational aid, which can be useful in this situation. The Braille printer can produce ink and Braille printing simultaneously and is easy to use, so it wins praise from teachers and staff of schools, colleges, and universities. For example, Oyama junior high school in Toyama prefecture, and others in Osaka and Fukuoka. Moreover in several universities, it has been employed as a valuable piece of equipment to support the education of the visually impaired. The Braille printer gains a good reputation in an American exhibition. A Kumamoto branch office (BO) and a laboratory opened. Nippon Telesoft has opened our Kumamoto BO and a development laboratory in the Kumamoto Techno Research Centre in Mashiki-machi, Kumamoto prefecture. Research, development and sales and marketing of equipment for the visually impaired are going to be conducted there.